There were three lacrosse players at Duke University who for more than one year were falsely accused of terrible crimes against women by the state of North Carolina and judged guilty by many of their own classmates and professors. However, according to news coming from “The News & Observer”, with the three students now proclaimed totally innocent by the state, it is those 88 “hanging” professors who have become the real victims of the scandal. The infamous Duke 88 claim that they are being victimized with “hateful” emails. Not only “hateful”, but some of the professors are claiming to have received actual death threats. When asked to explain the nature of the so-called death threats, only one member of Duke’s 88 Finest could explain. One law professor received an email which said “You’re an idiot, why don’t you jump off a building”. Whoo … That is real deadly, dudes! A question to the voters of Nevada? The Searchlight may be ON, but what good is the Searchlight, when the Searchlight is LOST? The leader of the Democratic majority in the US Congress, Harry Reid, of SEARCHLIGHT, Nevada, told reporters on Thursday that the war in Iraq “is lost” and that the US troop surge is failing. On Friday, he emphasized that what he said the day before was true, but that he did not say that “the war in Iraq is lost.” Although he could not remember what he had said, he was able to remember that he did NOT say what he said. We are strong enough to stand tall, tearlessly. We are brave enough to bend to cry and sad enough to know we must laugh again. We do NOT understand this tragedy. We know we did nothing to deserve it, but neither does a child in Africa dying of AIDS; neither do the invisible children walking the night away to avoid being captured by a rogue army; neither does the baby elephant watching his community be devastated for ivory; neither does the Mexican child looking for fresh water; neither does the Appalachian infant killed in the middle of the night in his crib, in the home his father built with his own hands, being run over by a boulder because the land was destabilized. No one deserves a tragedy. The Hokie Nation embraces our own and reaches out with open heart and hands to those who offer their hearts and minds. We are strong and brave and innocent and unafraid. We are better than we think and not quite what we want to be. We are alive to the imagination and the possibility we will continue to invent the future through our blood and tears, through all this sadness. We will prevail. We WILL prevail. WE WILL PREVAIL! A SLIDE SHOW from FLICKR Photographers about the Virginia Tech Shootings this week in Blacksburg, Virginia. Laura and I have come to Blacksburg today with hearts full of sorrow. This is a day of mourning for the Virginia Tech community — and it is a day of sadness for our entire nation. We’ve come to express our sympathy. In this time of anguish, I hope you know that people all over this country are thinking about you, and asking God to provide comfort for all who have been affected. Yesterday began like any other day. Students woke up, and they grabbed their backpacks and they headed for class. And soon the day took a dark turn, with students and faculty barricading themselves in classrooms and dormitories — confused, terrified, and deeply worried. By the end of the morning, it was the worst day of violence on a college campus in American history — and for many of you here today, it was the worst day of your lives. It’s impossible to make sense of such violence and suffering. Those whose lives were taken did nothing to deserve their fate. They were simply in the wrong place at the wrong time. Now they’re gone — and they leave behind grieving families, and grieving classmates, and a grieving nation. These sources of strength are with your loved ones. For many of you, your first instinct was to call home and let your moms and dads know that you were okay. Others took on the terrible duty of calling the relatives of a classmate or a colleague who had been wounded or lost. I know many of you feel awfully far away from people you lean on and people you count on during difficult times. But as a dad, I can assure you, a parent’s love is never far from their child’s heart. And as you draw closer to your own families in the coming days, I ask you to reach out to those who ache for sons and daughters who will never come home. And on this terrible day of mourning, it’s hard to imagine that a time will come when life at Virginia Tech will return to normal. But such a day will come. And when it does, you will always remember the friends and teachers who were lost yesterday, and the time you shared with them, and the lives they hoped to lead. May God bless you. May God bless and keep the souls of the lost. And may His love touch all those who suffer and grieve. The image, VT– mayhem, is subject to copyright by Lovey Lane. It is posted here with permission via the Flickr API by Kerfuffles. American parents send incredible amounts of money off to what are considered the “finest” universities in America, yet what do they get in return for such investments in a university such as Duke in North Carolina? Consider the three young men, star athletes at Duke University, who were falsely accused of heinous crimes and railroaded by the local legal establishment. Once the false charges became public, Duke University president, Richard Brodhead, destroyed the reputations of his student charges by quickly judging them as guilty in order to satisfy those clamoring for the young men’s hides. President Brodhead set the code of conduct for the university hierarchy. Almost immediately, a large cohort of the professors at Duke University, eighty-eight in number, instead of offering stewardship to their charges, instigated a shocking public rush to judgment against them. Those eighty-eight professors represented more than ten percent of the entire professorial entourage at Duke. With callous disregard for the lives of the students who had been placed under their protection, the “Gang of 88” disgraced themselves and were responsible for encouraging a lynch-mob attitude at the Duke campus. Furthermore, they gave the out-of-control District Attorney Mike Nifong, reason to believe that he could build political victory on the backs of the innocent students, whom he indicted in less than three weeks after charging them. The District Attorney will most likely be punished for his unethical conduct. The Duke University president will undoubtedly lose his position. However, none of the 88 disgraceful Duke professors will ever be punished for their despicable behavior, and American parents will continue to send their children to be influenced and taught by people without brains or consciences. Remember the Promise of Resurrection. Remember the Cross on which Jesus died. 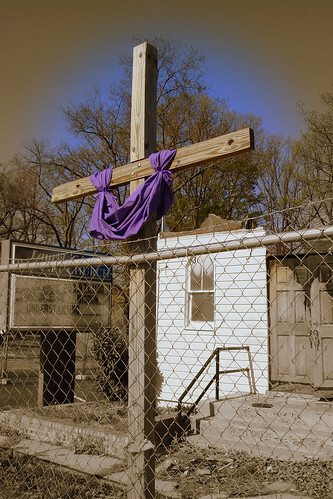 The image, Easter Remembered at Laurel Grove Church Ruins, Franconia, Virginia, is subject to copyright by barneykin. It is posted here with permission via the Flickr API by barneykin. You are currently browsing the Kerfuffles and Flourishes blog archives for April, 2007.